I feel I should issue a warning, though. Learning these concepts can lead some people to feel that all stories are ruined forever. If you’re just here for the reviews, don’t read any further. Personally, I find it enjoyable to spot the tricks, especially with a skilled author; it doesn’t ruin it any more than knowing how to spot individual brush strokes will ruin a masterful painting. Still, I’ve seen people become disappointed, and so I give you fair notice. The concept of foreshadowing is pretty well-known, but it’s often confused for the process of setting up a twist. Foreshadowing is best described by the principle known as Chekhov’s Gun, though that idea takes it from the opposite direction. Anton Chekhov (not Pavel, or else it would be known as Chekhov’s Phaser) meant to underscore the importance of not putting unnecessary things in the story. It’s been modified since then to describe the idea that certain things are expected to be used in certain ways; if they aren’t, then the audience is disappointed. That is foreshadowing. It overlaps slightly with, but is not the same as, the concept known as “setup and payoff,” or (less usefully) “the twist.” To put it another way, if you’re successful at pulling off a twist, that means you did not foreshadow it, but you did set it up. Foreshadowing, boiled down, is nothing more than using a thing the way the audience expects it. In Chekhov’s example, the appearance of a gun signifies a certain idea (namely, its use as a gun), and so it must be used or the audience is confused. The obvious use is as a weapon, but using it in a different way creates a “payoff,” or the twist. The audience both gets what it expects, and yet is still surprised. A few years ago, there were two Doctor Who stories that used this exact example. In both situations, the Doctor — an individual who, while not always nonviolent, normally tries very hard not to step over the line — finds himself with a gun in his hand. The first was in “The End of Time,” where the Doctor has been handed an old revolver, “just in case,” despite the fact that he doesn’t want it. The scene where he’s given it sets up the later payoff: if the Doctor does wind up using it, it means things have really hit rock bottom. It also gives the classic foreshadowing, literally employing Chekhov’s gun: the audience expects that gun to be used. The foreshadowing is about its use, pure and simple. The payoff is when the Doctor, faced with the impossible choice of killing one of two people, instead uses the gun in a nonlethal way: shooting out a key piece of equipment. The setup all along has been that he is only going to pull out that gun when things are at their worst, and that situation then reveals that the only way to solve things is to murder someone. The audience is left unsure how the Doctor is able to get out of it. And then the twist: the Doctor shoots the equipment, which strands him once more, alone among the stars, the last Time Lord. It is a huge personal cost for him, but one that leaves his morals intact. 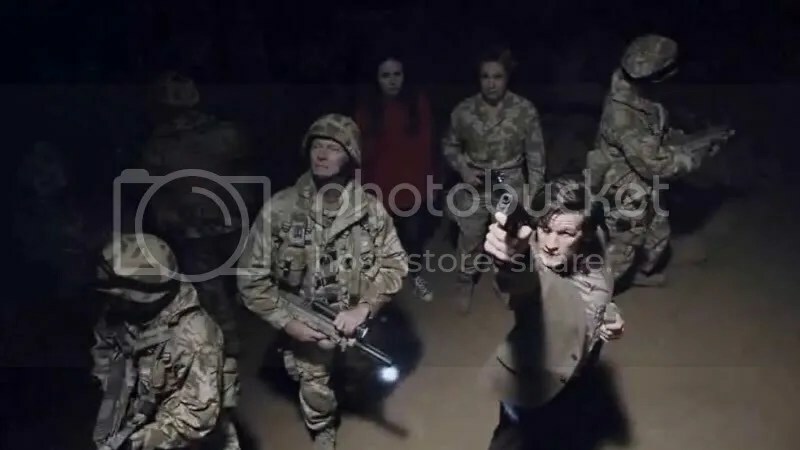 The second time the Doctor holds a gun is in the end of “The Time of Angels,” where the Doctor demands a soldier’s gun and gives his enemy a warning. The episode closes as the gun fires. The impact here is far less severe than in “The End of Time,” particularly when going on a Doctor Who DVD binge (meaning there’s only four episodes between these two scenes, while in broadcast there was over a year). We’ve already had a similar scene, and this time around we haven’t had the same sort of setup. The Doctor is also up against an enemy against whom bullets really don’t matter. It made a good moment in the series trailer, but not a good cliffhanger ending to a two-part episode. Sure enough, in the next episode (“Flesh and Stone”), it opens to reveal that the Doctor just used it to shoot out another piece of equipment, giving the good guys an escape route that seemed almost completely contrived. The nature of the escape wasn’t introduced ahead of time, or — to use the proper term — it wasn’t set up. Add that to the repeat of the gun, and there wasn’t nearly as much punch to that situation as there could have been. Sure. I’ll use Macbeth, which means it’s spoiler-free. (Okay, it’s totally not, but I’m just going to assume you studied it in high school. If not, here’s a very short version. Watch it and come back.) In the play, the three witches give a prophecy to Macbeth: the Thane of Cawdor shall be king. When Macbeth is appointed Thane of Cawdor and he kills the king, the prophecy comes true in a very literal way. Shakespeare uses both setup and foreshadowing at this point, when Macbeth goes back to the witches. He receives another prophecy: that he should “beware Macduff,” and then is told “none of woman born shall harm Macbeth.” Through foreshadowing, the audience knows that what the witches say is true, and so we expect it to come true. The setup lies in the misdirection, however, and so we have the twist at the end: Macduff reveals that he was delivered via Caesarean section rather than through a natural birth. All the prophecies have come true, but Macbeth assumed they were all literal simply because the first was — and so does the audience experiencing it for the first time. If you want to witness this in under two minutes, try this version by my friends. Rest assured, it’s devoid of any other literary value! The obvious way to start is by not letting the audience know what is and is not a clue. This, however, generally only works in mystery genre stories, where it’s known as the red herring. One of the best examples of this is in the Lord Peter Wimsy book Five Red Herrings, because there the audience is told up front that — with six suspects in a murder designed to implicate any of them — there are five false leads. Both Lord Peter and the police are at a loss at first, particularly since it was very nearly declared an accidental death rather than murder. People cannot be excited except about something; and at this stage of ignorance the reader has nothing to be excited about. People are thrilled by knowing something, and on this principle they know nothing. The true object of an intelligent detective story is not to baffle the reader, but to enlighten the reader; but to enlighten him in such a manner that each successive portion of the truth comes as a surprise. Another method is using humor. Everyone loves a joke, and so humor always justifies itself. In fact, it’s the only thing in a story that, theoretically, should ever be left to stand on its own; everything else should do double duty. Of course, technically, all humor exists on multiple levels anyway, which means that you can use it to distract even the eagle-eyed audience — at least, as long as they find the joke funny. Part of this lies in the fact that many jokes employ the idea of setup and payoff themselves — even the lowly lightbulb joke. 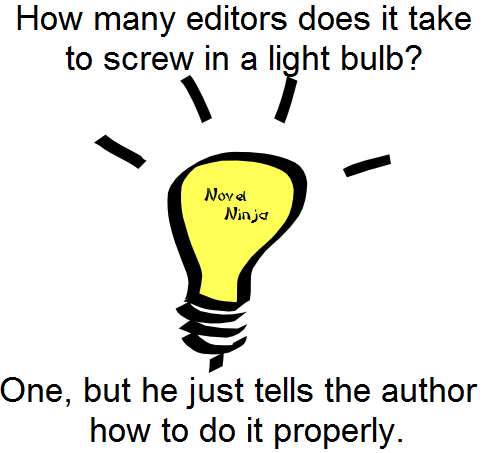 How many ninjas does it take to– Never mind, I blinked. The way to use this one is to drop the clue, and then provide some sort of humorous moment immediately during or after. It’s often used in Harry Potter, for one example; Rowling does an excellent job at packing key plot points and clues into a small space, as she can have as many in a few chapters as other authors have in whole books. The humorous and often wondrous situations the characters get into help distract the reader from spotting key moments until the right time. A third method is, in effect, the magician’s trick: giving the audience what it expects while revealing the truth only at the last moment. The difference here is that the story, unlike the illusionist, will reveal all at the end of the performance. This is the best technique, but also the most difficult because it must be subtle. It lies in letting the reader see the puzzle all along, with all the information needed to solve it, but presenting it in such a way that things fall into place only at the right moment. In another essay, Chesterton wrote about the importance of this literary slight-of-hand, using the Sherlock Holmes story “Silver Blaze.” Now, if you follow that link, the story will be spoiled; Chesterton thought it ridiculous to pretend otherwise, as Holmes stories at that time were so ubiquitous that it would be akin to saying today that Gandalf comes back in The Two Towers. 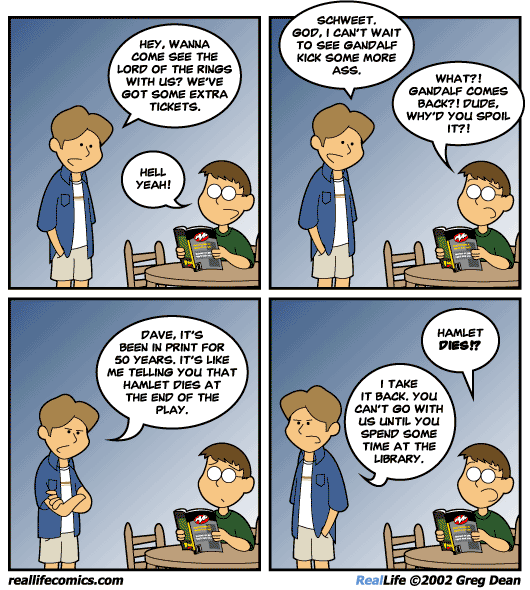 And when you’re done with that, click on the image to be taken to one of my favorite comics. Happy archive diving! Not every Sherlock Holmes story is a great example of setup and payoff, of course. If you want some mystery short stories that really exemplify setup and payoff, I recommend the Lord Darcy stories by Randall Garret (a $4 ebook from Baen for the complete series; what are you waiting for?). You can also see this in nearly every Hitchcock film, as well as the movie Charades (which feels exactly like a Hitchcock film, but he wasn’t involved). Of course, you should watch Hitchcock films anyway. Don’t doubt me. If you want a novel, though, my standard example is Elantris, by Brandon Sanderson. The reveal at the end is picture-perfect, and has been staring you in the face since the beginning — but since the clue was introduced before the context, it creates a textbook example of this technique. And, if you like that, you should move on to Sanderson’s other books. The reveal at the end of The Way of Kings (click here for my review) isn’t a punch-the-air moment like in Elantris, but it’s still a moment I stop to savor even on a re-read. If you’re looking for more, the podcast series Writing Excuses (which I’ve mentioned before) talks about this idea a lot, particularly since Brandon Sanderson is one of the co-hosts. You can find plenty of suggestions and examples on multiple episodes. Comments? Suggestions? Do you have an awesome example from a popular work of fiction that you think people have seen — or should see? Let me know below! I entirely agree about Sanderson being excellent with the whole setup and payoff th ing; one of the points I like about the Mistborn series (oops, I guess I must say “the original Mistborn trilogy,” although I’m liking the Aftermath stories as well), is how well (and how often!) he uses it present a story with more twists than a corkscrew, but with very satisfying finishes, both in each book, and the series as a whole. There are four twists I can remember seeing or reading that, when they happened, were like absolute gut-punches but in retrospect made perfect sense. All that follows are spoilers, of course. – The first twist is from “Half-Blood Prince”. YES, Snape kills Dumbledore. It was obvious in retrospect that Snape was a good guy, but that’s what makes it so brilliant: It was obvious in retrospect. When it happens in-book, we knew that Snape had been arguing with Dumbledore, knew Harry had suspected Snape many times before, knew Snape revealed the prophecy to Voldemort, and knew that he was a former Death Eater. So when he kills Dumbledore, it’s absolutely perfect. Sure, we THINK he’s on Dumbledore’s side, but there is absolutely no reason for us to discount that he’s really a bad guy. It’s entirely logical and utterly shocking. – The second was Moriarty’s suicide in “The Reichenbach Fall”. Everything about that scene was perfect. The way Sherlock was so totally out-manipulated, that little section of relief where you’re convinced he’s solved the problem, and the utter – OH CRAP NOW WHAT – feeling you get when Moriarty pulls the trigger. And again, it’s perfectly logical – as Sherlock later points out, we’ve known from episode one that he has no qualms about killing himself if it means destroying Sherlock. – The third is from the Asimov novel “The Caves of Steel”. The ending is absolutely brilliant. When the Commissioner is singled out as the killer, your first thought is that this is completely impossible, but as Elijah explains the series of events, you recognize the way Asimov outfoxed you. The set-up was pitch-perfect. The way he had Daneel, who we’ve relied upon as basically infallible in his pronouncements, announce the Commissioner dead as a suspect; how we’ve already considered him and dismissed him for solid reasons; and, of course, how his actions were consistent with his guilt. Just perfect. – The fourth is from the episode “Turn” from the final season of “Justified”. AVA SHOT BOYD. Again perfectly logical, and completely unexpected. Before it happens, you don’t consider it. After it happens, you wonder how you possibly couldn’t have considered it. It fit Ava’s motivations, it fit her personality, it was logical – and you didn’t see it coming, because everything that happened beforehand led you to believe she was going to have to pick a side. Striking out on her own made perfect sense, but because we had never considered it before, when it actually happens we’re just blown away. Incidentally, while that was the best, the “Justified” writers are the MASTERS of set-up and payoff, most evident in their third season. Season three was entertaining but more than their others, with the exception of the relatively (to the show’s high standards) weak season five, it was too convoluted for its own good. By the finale things had gotten pretty damn confusing and it wasn’t clear how they could really tie things together. …Which is why the season 3 finale was such an achievement, and tied the whole season together in a way that made the whole seem greater than the sum of its parts. Not only was every plot thread resolved, but every theme was addressed, every major character got the screen time they deserved (which was really a feat), and every single promise that season three made – and it made a lot – was paid off spectacularly. Even the little things. And of course, the episode’s final line is one of the most powerful, and tragic, I’ve ever read or heard. It is perfect…absolutely perfect. It’s episodes like “Slaughterhouse” that push “Justified” out from the realm of good shows and into the realm of great. And that’s one of many examples.